Kitchen is usually overlooked when doing the interior décor for the house because lots of people think the kitchen should only be practical and safe. However, the kitchen need not dull and boring and can also do with a facelift. You can liven up your kitchen to give it a more ambient atmosphere that makes every moment you spend there warm and inviting. Since your kitchen also acts your storage space, you should organize it in way that you have all the essential items you need to whip up a quick meal and also keep stuff for long. Here are the tips to improve your kitchen. The layer of paint in your kitchen decolourises faster than the rest of the house because of the comparatively higher temperature there. So, every now and then, give your kitchen a fresh layer of paint. Choose a bright colour that to make your kitchen vibrant which ideally should blend with your other kitchen installations like cabinets, shelves and curtains. 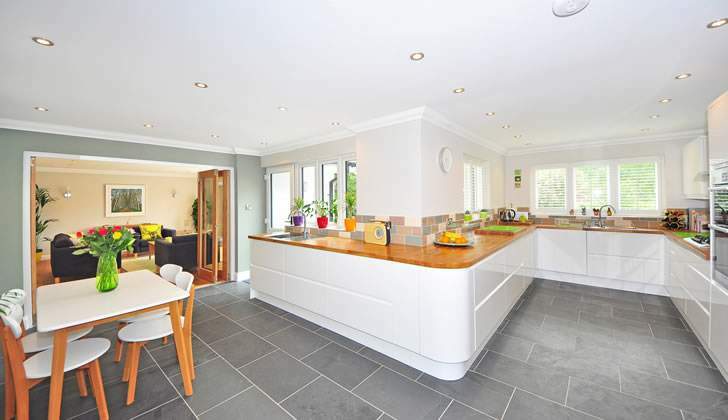 Having one colour scheme in your kitchen gives an illusion of space. In addition to that, you can add a few paintings and pictures at the appropriate places to make your kitchen livelier and colourful. Your storage space should be organized in a manner that items that regularly used are easy to reach and those that are used once in a long while are kept at the back. This will stop you from overturning your kitchen every time you need to prepare a meal. Your kitchen should an assortment of storage options like drawers, shelves and cabinets, to hold your various utensils, ingredients and appliances. It is also equally important to have a prepared pantry that is well stocked with essential items so you don’t have to dash to the grocery store every time you have a guest. You should be able to whip up a meal on short notice. You must maintain the highest standards of hygiene in your kitchen. A dirty kitchen is a health hazard that can cause severe food poisoning for your family and house guests. While cooking, wipe any spills as soon as they happen and bring the waste bin near you so you don’t throw food wastes on the floor. After cooking, clean your kitchen top with a disinfectant to prevent the growth of harmful bacteria and never leave a pile of dirty dishes in the sink for more than a day. Although kitchen cabinets are essentially part of your storage, they can greatly add to the décor of your kitchen. You can aestheticize your kitchen cabinets to improve the appearance of your kitchen. On a small budget, you can change the old handles to shiny new ones. Something as simple as door knobs can transform the ambience in your kitchen. On a big budget, you can overhaul your cabinets and install new ones. You can change the panels that have become worn out with age and put gloss panels or replace your wooden cabinets with glass.